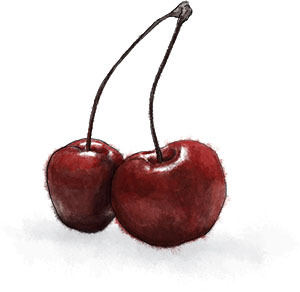 I have a soft spot for cherries that’s firmly rooted in my childhood. The skirt with the net underskirt, spotted with cherries, that I wore to the Headlands Hotel Disco. Cherryaid at birthday parties (the only time my sister and I got free reign to choose beverages). A cherry-scented eraser that was all the rage at school until they were banned because the chemicals made us all go hyper. I’m still partial to a cherry jelly sweet or a lick of cherry lip-balm. I eat maraschino cherries out of the jar and pour their syrup into club soda on hot days. New York is having something of a cherry bonanza at present. We’re in the final few weeks of bright scarlet Bing season, but getting the first crops of the yellow blushing Rainiers, and well into claret Sweetheart territory. My local fruit stand has them all on discount. While a handful served in a bowl of ice water to keep them chilled would be a perfect Monday treat as far as I’m concerned, this salad is delicious, fairly low effort, and completely worth it. The cherries really shine. Brush with olive oil and bake (on parchment or foil for ease of washing up) on a tray in the oven at 350 for 10 minutes. Tip the slivered almonds onto the tray to toast for the last minute. Now for the dressing; mix the olive oil, the balsamic vinegar and either finely dice the shallot, or grate on a coarse grater. Season well and shake or whisk to mix. Mix the mesclun, the arugula and the mint, and arrange on a plate, top with the cherries, almonds and goat cheese disks and drizzle the dressing over. Coat the cheese in egg wash and panko bread crumbs before frying in a non-stick pan with splash of olive oil. With a paring knife. Put the cherry on a board covered with a tea towel – so the cherry can’t roll around. Stick the point of the knife into the cherry under the stone. Push the stone upwards and out. With an orange stick – yes, the ones you would use for a manicure. Cherry on a tea towel again. Poke the pointy end of the stick into the cherry to the stone. Dig, twist and out it pops. It takes a few cherries to get the hang of it, but it works. With a cherry pitter. Pop the cherry under the little hammer and squeeze. Perfect. As well it should be, since that’s its only function in life. 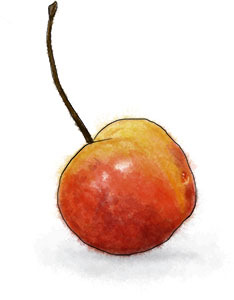 If you’re serious about pitting cherries, you should get one and just accept that for the rest of the year it will be cluttering up the kitchen drawer. This entry was posted in The Monday Treat and tagged almond, arugula, cherries, goat cheese, healthy, mint, rocket, salad, vegetarian, walnut. Bookmark the permalink.